It is so hard to believe Thanksgiving 2017 is over and that we are heading into the CHRISTmas season. However, I truly had a wonderful Thanksgiving Weekend and am so thankful for so many blessings. 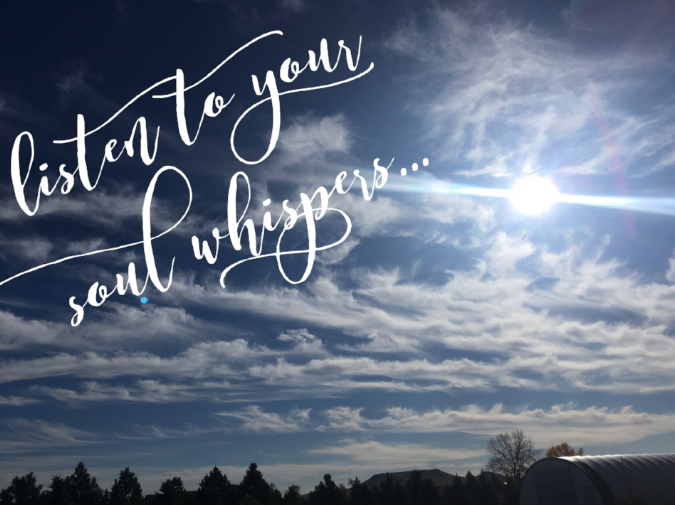 #soulwhispersbyJodiAnn Photo taken by me at our new place. I headed into the 4 day weekend with BIG plans of getting so much done around the house, personally, boxing up more stuff at the old house AND being on top of my work stuff to start the week fresh. I just knew with 4 days I would have time to relax AND to get sh$t done!! A few of us came together and threw together a very last minute Turkey Trot for those in our local area and took a free will donation and thanks to the 30ish very generous walkers, we were able to give a $220 donation to the Frontier Travel Center to help pay for some Thanksgiving meals!! Slept in til 10am one morning! Went shopping with my daughter and Granddaughter and then had a coffee date with my Little Miss, went shopping some more and Boppa and I played with Little Miss. Played Skipbo with our daughter!! We used to play games and cards all the time and have gotten out of the routine!! Got in 2 amazing walks and meditations in gorgeous weather! Putzed on my house and cleaned a little teeny tiny bit and put away a couple more boxes of stuff from old house. Went with Robin and Amanda, Little Miss, Olivia and Sophia to an open house which was so much fun! Visited with my Grandpa Roy! (I did snap a few photos over the weekend but am short on time today to share those here, so feel free to go browse my Instagram Account or my personal Facebook page or my JodiTivey.com Facebook page! In other words, I filled my SOUL...I listened to the gentle nudging of my soul whispers telling me what I truly needed...and that was a break from the go-go-go that our world tends to be...to slow down and enjoy what is most important. I took time to really listen to what was making me happy at the moment and I also listened to what wasn't making me happy. I had some fun new ideas come through and I let go of some others without even trying!! Was I ready for Monday morning...nope not one bit but you know what, I am surviving!! And my heart and soul are happy for the moment and I am aok with that! !